Nokian Neulomo is recruiting people! It was announced, a few days ago, that Nokian Neulomo Oy bought the Nokia factory business from Nanso. Thanks to the open-minded thinking, huge courage and strong willpower of keeping the factory rolling! But what does this practically really mean and what’s happening in the short-term future? You as a model perhaps? 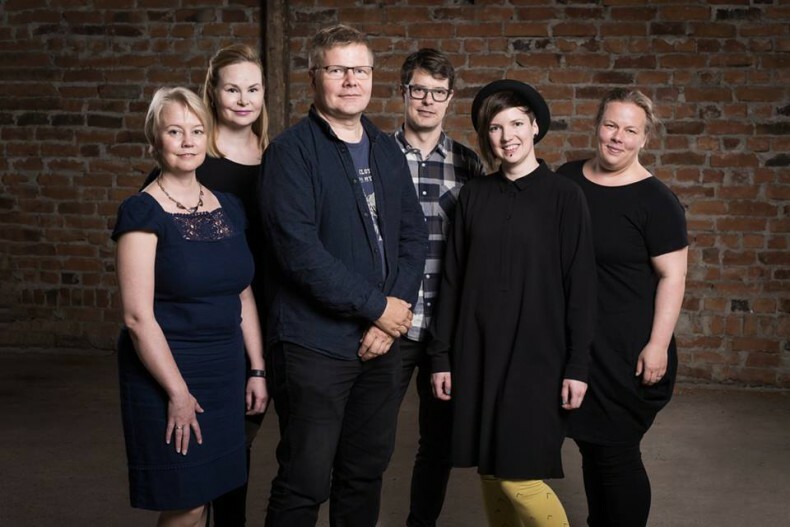 Nokian Neulomo team from the left: Päivi Pajunen, Marika Snellman, Anna Kurkela, Jussi Kurkela, Vesa Moisio and Hanna Lusila. Photo: Mikko Ovaska Photography. Everybody is interested in what is happening practically, right? So let’s have a look! As said earlier, this has a significant impact on employment and the 85 former workers of Nanso will come back from their summer holidays as workers and sewers of Neulomo. Good news of course! In addition, new people will be hired as well. Since the Made in Nokia pre-sale held in July and the ongoing pre-sale of colorful Marika-tunic and Sanna trousers have been excellent, more sewers are needed and the recruitment starts very soon in July! It’s worth to follow Neulomo’s Facebook-page or check-out their website. Not only to get more information about the beginning of the recruitment but also to get other kind of information and see the different campaigns Neulomo has. 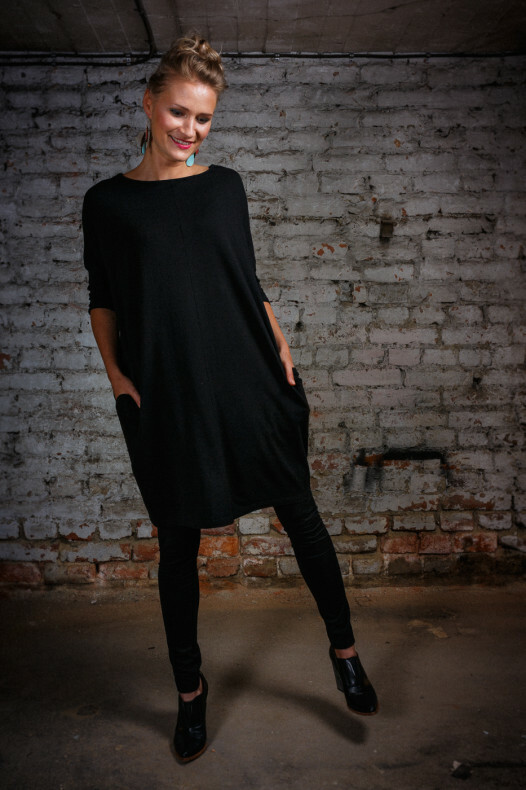 The black Marika-tunic, now also in other colors! Photo by Pasi Tiitola, Muah by Keidas by Lumo, earrings by Uhana Design, shoes by Terhi Pölkki, model Vilhelmiina Järvelä. 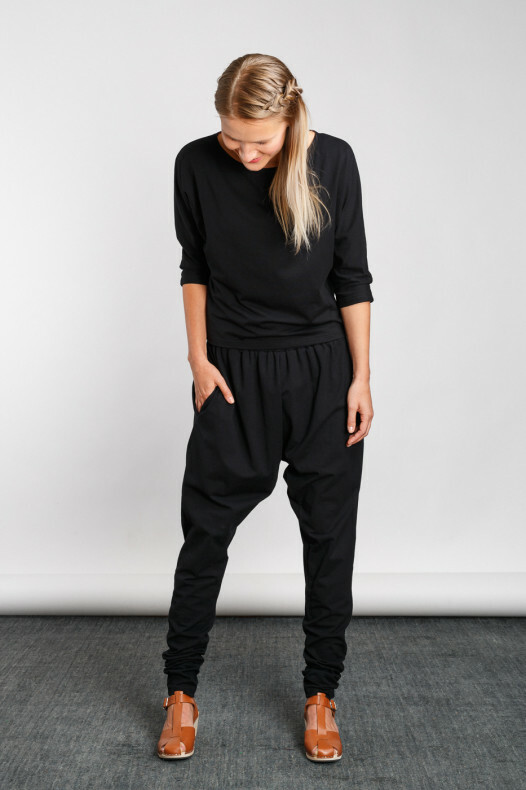 The black Sanna trousers, now also in other colors! Photo by Pasi Tiitola, Muah by Keidas by Lumo, earrings by Uhana Design, shoes by Terhi Pölkki, model Vilhelmiina Järvelä. Other partners are also needed and wanted due to the changes in the business. Neulomo is also looking for partners who are interested in producing clothes or yarn from Nokian Neulomo. If this is something you are interested, contact joinus@neulomo.com for more details. And how can you be part of this magnificent story? Well, let the inner model in you wake up because YOU can be one of the models Neulomo wants! Neulomo is looking for Finnish women, different size and age, to model the upcoming collection, which will be launched in Autumn. Also this recruitment starts already during July. By following Neulomo’s Facebook-page and the recruitment page, you can let the inner model be one of the models! The factory will be re-opened in the beginning of August after the workers summer holidays. There is coming more fantastic, good news after that!